If you are preparing for your trip and want to know a few pointers and tips in advance, download the Telunas Private Island Pre-arrival Information or Telunas Beach Resort Pre-arrival Information. Love the boat rides to and from – we sat on the front row and getting slightly wet, which was awesome! We recommend booking your round-trip tickets through Batam Fast ferry operator from HarbourFront Ferry Terminal, Singapore to Sekupang, Batam. Please wait until six months before your stay at Telunas Resorts before booking your Batam Fast ferry tickets as Batam Fast ferry tickets are available approximately six months in advance. 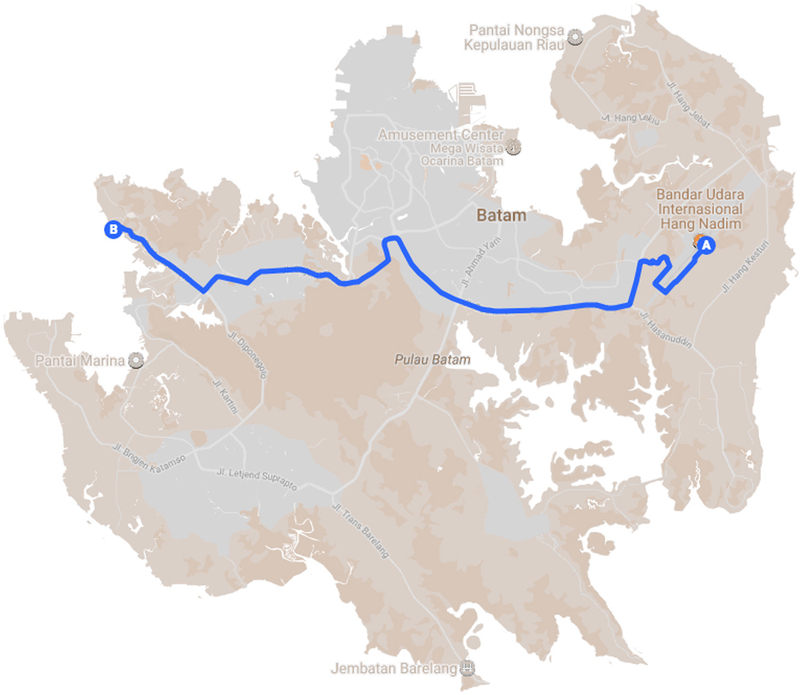 Transfer time between HarbourFront Terminal in Singapore and Sekupang port in Batam is approximately 1 hr. We recommend arriving as early as 1.5 hrs prior to your departure and heading through immigration as soon as your ferry is available. Please note the 1 hour time difference between Singapore and Indonesia. After purchasing your international transfer tickets (see options above), you will receive a booking confirmation email from BatamFast. Please forward this email to stay@telunasresorts.com. Upon your arrival to Sekupang, Batam, a Telunas Resorts team member will meet you after immigration and guide you to the Telunas boat for a ride in our traditional wooden longboat (a modified, comfortable Melayu Fishing Boat) past mangrove forested islands on the way to Telunas Resorts. This domestic round trip ticket (IDR 900k++/adult and IDR 580k++/child) is purchased during the Telunas Resorts booking process. 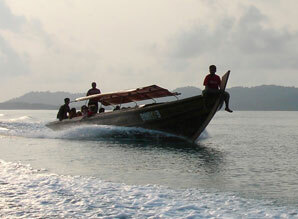 Transfer time between Sekupang, Batam and Telunas Resorts is approximately 1 hr. 40 minutes. From Hang Nadim Airport (BTH), take a taxi to Sekupang International Ferry Terminal. 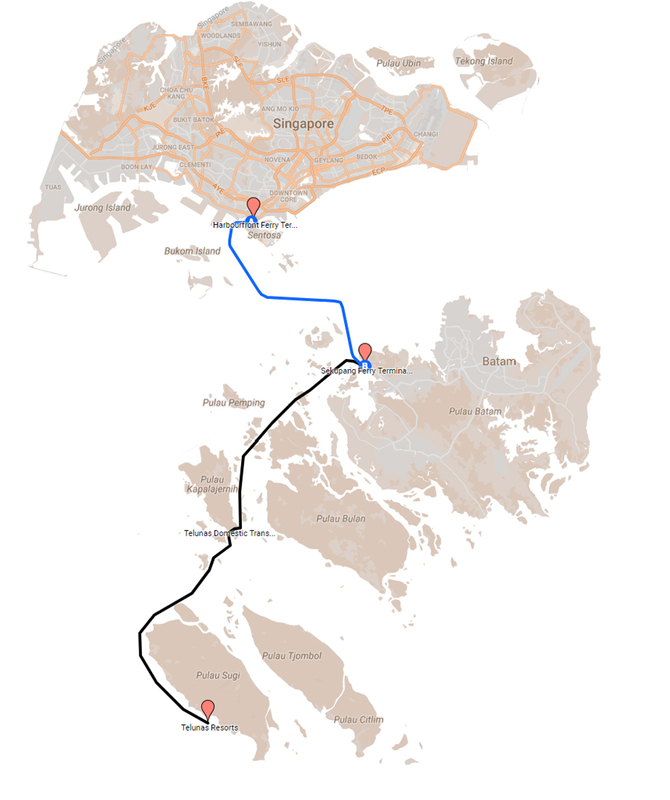 It is generally about a 45-minute hour taxi ride from BTH to the Ferry Terminal and costs somewhere around IDR 150k. When you arrive at Sekupang International Ferry Terminal (note: not Sekupang Local Ferry Terminal), please go to the information desk on the first floor. One of Telunas’ staff will meet you there and guide you to the Telunas boat for a ride in our traditional wooden longboat (a modified, comfortable Melayu Fishing Boat) past mangrove forested islands on the way to Telunas Resorts. Prior to your arrival in Indonesia, please make sure you are holding a passport with a validity date for more than 6 (six) months from the arrival date. Passports from 169 countries can enter Indonesia at Sekupang International Terminal and Batam Center Terminal for 30 days without a Visa. This includes guests from Austria, Canada, China, Denmark, France, Germany, Hong Kong, Italy, Japan, Malaysia, Netherlands, New Zealand, Norway, Philippines, Russia, Singapore, Spain, Sweden, Switzerland, Thailand, UK, the United States, and Vietnam. If you do need a Visa, you can obtain a Visa On Arrival (VOA) at Sekupang Ferry Terminal or the other Ferry Terminals in Batam. It is valid for a maximum stay of 30 (thirty) days, and is given to citizens from countries that can apply VOA for leisure visit to Indonesia. Please refer to this Indonesia Ministry of Tourism website for the list of countries that can apply for VOA in Indonesia. A fee of $15.00 US for 7 (seven) days or $35.00 US for 30 (thirty) days.